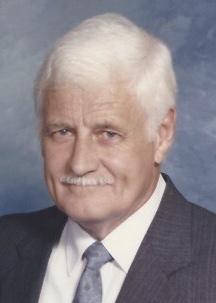 Walter T. Nolan Jr. passed away peacefully on April 19, at the age of 90. He was surrounded by his family and friends. Walter was predeceased by his wife of 61 years, Elizabeth (Doris) Nolan whom he lovingly called his 'Beautiful Bett’. After serving his country in Korea, he attended and graduated from the General Electric Apprentice Program. He continued his education at Northeastern University where he earned a degree in Engineering. Walter worked as a Quality Control Engineer in the Aircraft Engine Division at the Riverworks Plant in Lynn, MA until his retirement in 1993. He was a member of the General Electric Elfun Society. He loved playing golf and his guitar, boating, and just being near the ocean. Walter was known for his quiet humor, quick wit and helpful ways, and for his beautiful blue eyes. He was a devoted father to his six children, Kathleen and husband Charles Breece, Mary and husband Luther Hastings, Janet and husband Richard Florino, Thomas and wife Lori, Lynne and husband Mark Warner, and Michael. He loved all children, especially his fifteen grandchildren and nine great grandchildren. He is also survived by many nieces, nephews, cousins and friends. He will be dearly missed by all who knew and loved him. A special thank you to the staff and caretakers of Avita of Newburyport and Ascend Hospice for the love and care they gave to Walter at the end of his life. You are all truly special people. In lieu of flowers, donations may be made to https://www.alzinfo.org/about/. Calling Hours will be held on Tuesday, April 24th from 4 to 8 PM at the Goundrey & Dewhirst Funeral Home, 42 Main Street, Salem, NH 03079. A funeral mass will be celebrated on Wednesday at 10:30 AM in St. Joseph's Church. Burial will be at 1:30 PM that afternoon at the NH Veterans Cemetery in Boscowen, NH.